William Henry “Bill” Gates (born October 28, 1955) is the founder of a software company named Microsoft Corporation. He’s presently the chairman of Microsoft and the largest individual shareholder with over 8 percent of the common stock. Bill Gates has consistently held the position of the world richest man more than 12 consecutive years. Bill Gates is also regarded as an entrepreneurs, philanthropist and author. Below are some famous quotes quoted by Bill Gates. "Success is a lousy teacher.It seduces smart people into thinking they can't lose"
"So it's an absolute lie that has killed thousands of kids. Because the mothers who heard that lie, many of them didn't have their kids take either pertussis or measles vaccine, and their children are dead today. And so the people who go and engage in those anti-vaccine efforts -- you know, they, they kill children. It's a very sad thing, because these vaccines are important." "DNA is like a computer program but far, far more advanced than any software ever created." "We were young, but we had good advice good ideas and lots of enthusiasm." 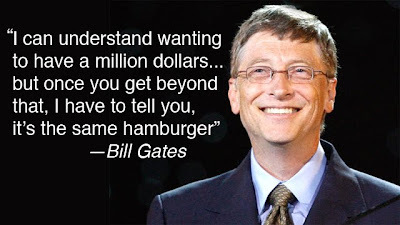 For questions or suggestions about Bill Gate's quotes or would simply like to include another quote from Gates, please feel free to contact us.